Puget Sound Infrared offers Aerial Infrared Imaging through our affiliation with Stockton Infrared Thermographic Services, Inc™ and our membership in the AITscan network. Stockton Infrared has been a leading provider of Infrared Thermographic Services as a means of predictive/preventive management (P/PM) for customers since 1989. The company founder, Greg Stockton is widely considered one of the best thermographers in the country in addition to being a renowned innovator of infrared applications. Waterproofing problems manifest themselves in two ways: Leakage and entrained moisture contamination. Leakage is pretty simple, although the leak inside the building rarely directly relates to the exact spot on the roof, since the water flows down the slope of the roof to a spot that is not sealed and into the building at that point. Most leaks occur where the waterproofing is sealed or where there is a penetration of the roof. Since most types of roof systems absorb some amount of water, it is harder to find the exact spot of water contamination in the insulation because it may not leak into the building until it has absorbed all the water it can hold. 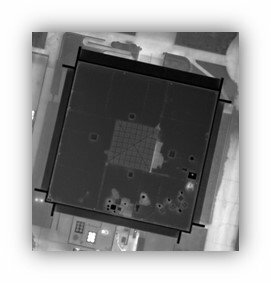 Aerial infrared imagery is affordable and effective providing invaluable information about your roof. Our specialized services are an asset to you and your organization as we have a clear understanding of your facility lay-out and type producing a time and cost-saving product. Plus, the “window” to perform the services is longer than the window for walk-on infrared roof surveys. Access to multiple levels of the roof. High-angle, straight down infrared images lessen reflection problems. High-resolution images capture large areas at once, making report writing easier and less expensive to produce. Plan view allows for infrared images, visual images and AutoCAD drawings to be reconciled closely. As a result, the report is clear, concise and easy to understand. 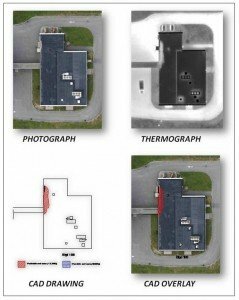 Plan view imaging allows accurate marking of areas of suspect roof moisture contamination. The printed AutoCAD drawings can be used on the roof to paint areas of moisture contamination directly on the roof (after verification), if desired. The trending of roof moisture becomes possible. Further processing can be done on roof areas of specific concern. AITscan™ is the industry leader in aerial infrared applications. AITscan™ thermographers accomplish high-resolution, surgical aerial IR missions such as flying over large commercial and industrial flat and low-sloped buildings to find subsurface roof moisture. The assets are strategically located throughout North America enabling us to provide services to clients anywhere. Pete Sutch – Level 3 Certified Infrared Thermographer #66019 – Authorized “RoofScanIR” Contractor with United Infrared, Inc.